A while back I had a free evening, so I decided to go to the store and buy some items to give away to those who needed them more than I do. It was a good idea, something I want my life to be characterized by more and more. I realized that everyone I knew had enough, that I didn’t know many people who were truly in need, and that I need to change that. I needed to go and intentionally meet people who don’t live like I do or think like I do, people who could never repay me. For their sake but for my own as well. I remember a time that I could have echoed his words; that I really do not know anyone in serious need of anything. God has brought me to a place in my life where that no longer applies. I spend every day with people at the bottom. Hurricane Katrina took all their possessions, uprooted their lives, and left them grasping to stay afloat. Building materials, clothing, school supplies, food, clean drinking water, baby formula, furniture, bedding, transportation, you name it; people in Lakeshore need it. God’s gracious hand of provision allows me to begin meeting a dizzying array of these needs. We see 2,500 or so registered families come through our distribution center. 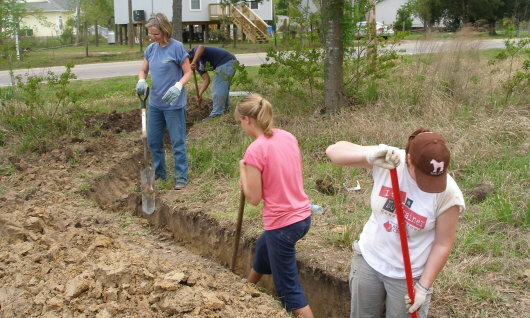 Through the hard work of volunteers we have rehabbed over 100 flooded homes in our community. 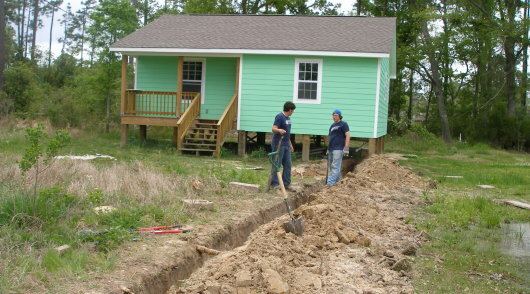 We have begun working on the 29th house built completely from the ground up. With all that, I still feel the overwhelming reality that over 4000 families still live in temporary housing in our county. For many, nothing more than a camper provides them shelter. Those living in FEMA provided housing know that in a matter of days or weeks this option will dry up, leaving them completely homeless once again. Some folks have come by the church asking for tents to live in. The need remains great. You can check out our list of needs, plan a mission trip to Lakeshore, or make a donation to the ongoing ministry of mercy God has granted us on the gulf coast. This coming Tuesday my wife and I will fly to San Francisco where I’ve been invited to speak at the 2008 West Coast Reformed Baptist Pastors Conference hosted by our friends at the Livermore Reformed Baptist Church. Check out their Lakeshore mission trip report. I’ve been asked to speak on God in the Storm and Mercy Ministry in the Local Church. I’ll then fly to Louisville KY and preach at the Immanuel Baptist Church on Sunday April 13. I’m looking forward to meeting up with some of my good friends there, especially Doug Thorpe and Kristy Miller who have both made numerous and extended trips to Lakeshore. Then later that week, I’ll stay in Louisville for the Together for the Gospel conference. I’m excited to hear seven of my favorite preachers, Mark Dever, Ligon Duncan, C.J. Mahaney, Albert Mohler, John MacArthur, John Piper, and R.C. Sproul. I know that several Lakeshore mission trip veterans also plan to attend, so if you will be there, please let me know and perhaps we can get together. On Wednesday night, April 9, my friend Mike Corley will preach in Lakeshore to our nearly 200 volunteers from North Carolina, Illinois, Michigan, Tennessee, Georgia, and Florida. Mike hosts a great syndicated talk radio show. Check out the Mike Corley Program – “Radio that’s not ashamed of the gospel.” You can listen to him online. He may also be on the radio in your area. If not, call your local station and request it. He plans to broadcast live from Lakeshore on Wednesday April 9. On Sunday, April 13, Stacy Morgan will preach at Lakeshore in my absence. While I have not met Stacy, he comes highly recommended by our friend Dale Crawford of Trinity Baptist Church in Baton Rouge. April 16, my friend, Eddie Exposito, will preach in Lakeshore on Wednesday night. Eddie serves as pastor of Sovereign Grace Fellowship in Slidell LA. All three of these men maintain a solid theology and a strong passion for expositional preaching. While I do not relinquish the pulpit often, I trust that God will speak through his word and these men as they proclaim the gospel with boldness, clarity, and compassion in Lakeshore. I’ll return home on Thursday April 17. This 10 day trip will be the longest I’ve been away from Lakeshore since the storm. I have to admit that I’m a little anxious about going. so much work remains in Lakeshore, but God has blessed me with some wonderful folks who will hold down the fort (or I guess I should say, build up the fort) while I’m away. I’m going to miss seeing the great teams that plan to work in Lakeshore next week. i pray that God will bless the work of their hands as he continues to rebuild Lakeshore for his glory. There are a lot more commercial stores open now than were last time I came down. The church started building its 27th house while I was there. The process of building houses runs a lot more like clockwork now. The church even has a floor plan for the “Lakeshore House” – a small two bedroom, one bathroom, utility room, and combined living/dining/kitchen area that they are building for elderly people, people on fixed income, and others who can’t afford to rebuild their house after FEMA turned up its bureaucratic nose at them and the insurance companies left them high and dry. 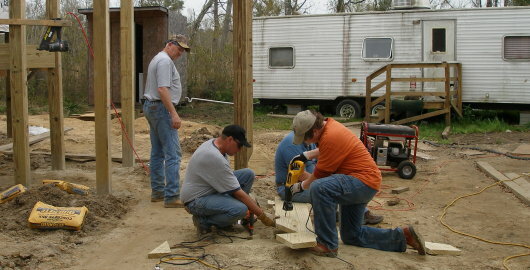 In some cases, the church will help people who have some money build a larger house – since all the volunteers work for free, the homeowner can use their money solely for materials and let the volunteers build it. In any case, Lakeshore, and the communities of Waveland, Bay St. Louis, and the rest of southern Hancock County are not going to run out of people needing new homes anytime soon. It’s been two and a half years after the hurricane, and there are still countless people living in FEMA trailers with formaldehyde who currently don’t have anywhere else to live. Don Elbourne, the pastor of Lakeshore Baptist Church, told me that they expect to be doing rebuilding for at least another 3-5 years, so the opportunity to help out down there isn’t going away anytime soon. You can read his full report, “Back from Lakeshore.” As always, Stephen brought his camera and snapped loads of great pictures. Visit his Lakeshore photo gallery for pictures from this and previous trips.